The site being taken on by the Evesham Abbey Trust does not include the choir, chancel, crossing, eastern claustral range, or the transepts (all of which are under the grass in Upper Abbey Park). The scope and planning of any research archaeology project must take into account the security, access and significance of areas potentially available for excavation. There is certainly significant scope for further archaeology on the site (little has been done since 1990); and Dr Cox has kindly offered to advise any and all such work. If the estimated length of the Lady Chapel was 70 feet, then the total length of church was 350 feet. A number of abbey plans have been drafted based on this earlier work. In turn, these plans have inspired a number of artistic re-imaginings of the abbey. Unfortunately many of these plans and images include significant elements of speculation. This means that there is a lot of scope for new and revised understanding not only from initial archaeology (in the Conservation Project) as well as research archaeology. Unknown location: Location and layout of the church of the Blessed Trinity (founded by Earl Leofric and Lady Godiva). Abbey site: Layout, function and purpose of abbatial buildings. Current understanding is mostly based on informed speculation, meaning there is significant scope for a better and more fully-informed understanding of this ancient abbey. Abbey site: Design and detail of the abbey nave, choir and chancel. For example, it has been suggested that the nave arcades could have had a ‘giant order’ elevation as at Romsey Abbey; a proposal discounted by D.C. Cox as unlikely. 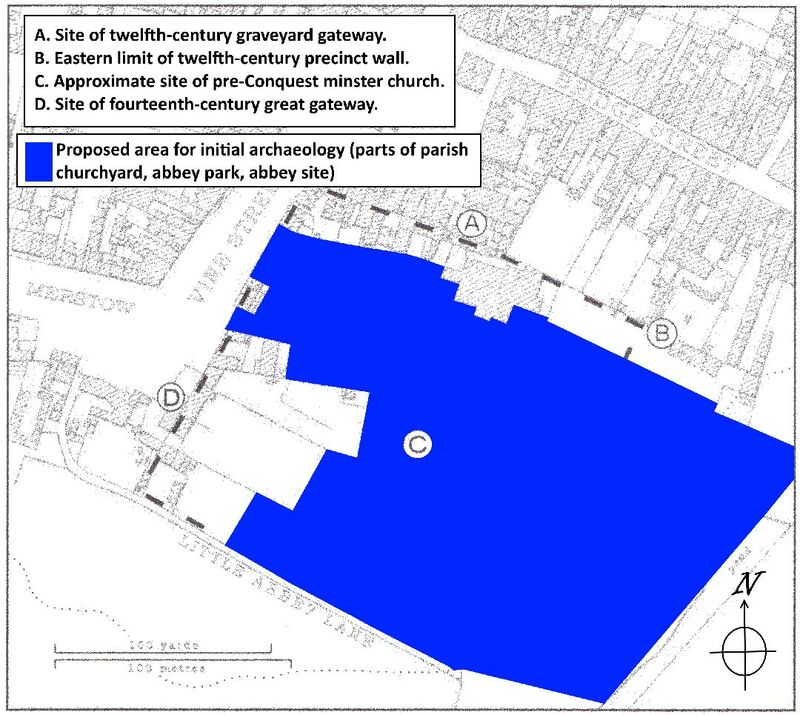 Abbey Park: Identify the location of key features of the chancel, including burials and side-chapels. This will build on previous archaeology. Abbey Park: Identify the location of structures in the eastern claustral range, including the chapter house. Abbots who died after 1078 and before 1189 were likely buried in the chapter house. This will build also on work undertaken in previous archaeology. Abbey Park: Identify the size and location of the crypt which became a focus of devotion to the Virgin probably in the 12th century and housed an altar of “St Mary in the crypt”. Parish churchyard: Identify evidence of the path leading from the Norman Gateway to the north door of the abbey church used by newly-elected abbots when arriving at the abbey for their installation. Parish churchyard: Identify evidence of the path leading from the north door of the abbey church to the Bell Tower (this path is implied in the function of the Bell Tower as a cemetery gate linking the lay churchyard with the monk’s graveyard which were, respectively, west and east of the Bell Tower). Parish churchyard: Identify evidence of cobbled paths leading to All Saint’s Church (the site manager Doug Littlewood has mentioned the presence of cobbles under the grass to the north of the churchyard). Parish churchyard: Identify evidence of the lost chantry chapel of St Katherine attached to the north aisle of St Lawrence’s church. Parish churchyard: Identify evidence of the “very great and curious walk” leading from St Lawrence’s church to the abbey complex. Further research objectives and questions are likely to be produced following the initial archaeology. Furthermore, some of the research questions from the earlier work are likely to be explored in much greater depth and detail during the project. A major dig will require extensive discussion with Historic England and formal scheduled monument consent. Investigation of the chancel and eastern claustral range – which sit beneath the grass in Abbey Park – will require permission required from Wychavon District Council who lease the site from the Rudge Estate. Non-invasive surveys of the parish churchyard will require approval by Evesham PCC. The digging of test pits or trenches will, by contrast, likely require not only approval by the PCC, but also formal faculty permission. The scope, structure, objectives and timetable of any research archaeology project will be determined if there is considered to be sufficient archaeological potential on the site. If this work does go ahead, this will mean that the development of the Nave Garden, Cloister Garden and Abbey Grounds Garden will likely be delayed. The trustees lack the experience and background in managing archaeological work. If this project goes ahead, then, it is expected that it will be organised and managed by a third party (perhaps a local university) with the full co-operation and support of the trust. D.C. Cox (1990), ibid., p.124. D.C. Cox (1990), ibid., pp.123-124. D.C. Cox (1990), ibid., p.125. D.C. Cox (1990), ibid., p.126. D.C. Cox, ‘Evesham Abbey: The Romanesque Church’, Journal of the British Archaeological Association (JBAA), vol. 163 (2010), p.55 (pp.24-71). E.A.B. Barnard, ‘A vanished Chantry formerly in St Laurence Church, Evesham – interesting discovery’, Old Days in and around Evesham: No. 31 (Evesham Journal, 7 August 1920). George May, A Descriptive History of the Town of Evesham (Evesham: George May, 1845) p.176.